Having just returned from meeting the real Willow, beautiful, wide-eyed, charming and with green ice lolly remnants covering her cheeks, I simply cannot envisage turning her fictional equivalent into anything as weird as an aardwolf in my next novel. Today was the first time the real Willow met her fictional alter ego in book format – she immediately wanted to use her new-found vampire strength to show that rude 6-year-old boy in her school where to stick his threats. 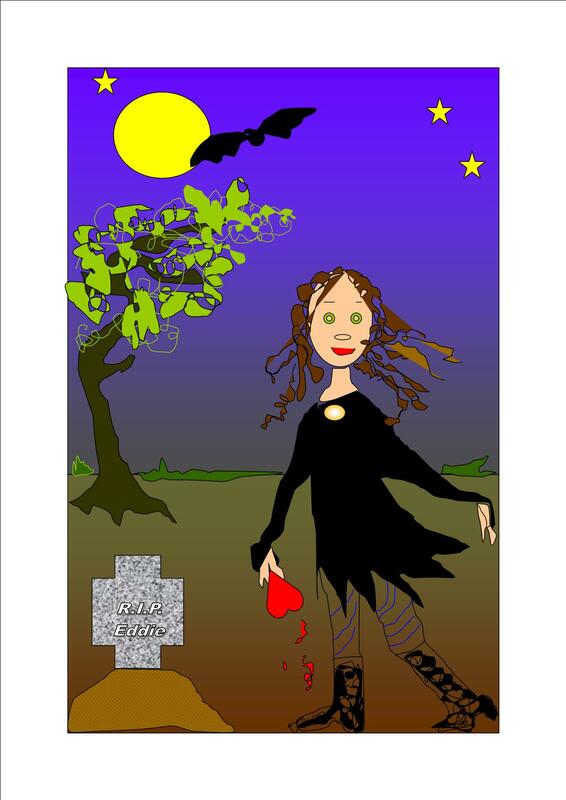 The real Willow, you understand, is quite a bit younger than the vampire equivalent…but she is as resourceful as my fictional heroine…and just as brave. A little wolf cub with green cheeks growling at the world! We have finally come to the end of the mustalid series and are now entering the realm of Hyaenidae, which consists of four different species, the aforementioned aardwolf and the spotted, brown and striped hyenas. If ever there was an oddball among the mammalian contingent, it is most certainly the aardwolf. The word “aard” comes from the Dutch or rather the Africaans and means “earth wolf” (Erdwolf in German), probably because the aardwolf lives in burrows to escape the hot African sun during the day. It’s not a creature Willow the Vampire would ever come across in rural Stinkforthshire, that’s for sure! Looking like a cross between a hyena, a wolf and a jackal, the aardwolf carves out a meagre existence in the scrublands of Southern and Eastern Africa, where it hunts mainly insects like termites, larvae and occasionally feasts on carrion. Just like the cute aardvark, the aardwolf has a long, sticky tongue that can hoover up some 200,000 termites in a single night, which it grinds down with its peg-like teeth. The aardwolf is quite a lot smaller than its cousins the hyenas and to look a little more imposing, the aardwolf has a mane that can stand erect to lend more gravitas to its owner. Although the four members of the Hyaenidae look very much like dogs, they are actually classified as cat-like, carnivorous mammals, being closely related to civets and cats, when it comes to their skeletons. Aardwolves sleep during the day in their burrows and come out at night to hunt, when the searing sun has gone down and insects start being active again. 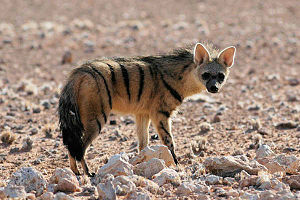 With their slender dark muzzle, striped body, large pointy ears and long bushy tail, aardwolves are a sight to behold. They are mostly found in grasslands and savannahs, as they are very specific with regard to the food they eat and typically live, where their favourite type of termites likes to dwell. 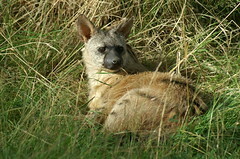 A fully grown aardwolf weighs around 9 to 14 kg (ca. 18 to 28 pounds) and is around 40 to 50 cm tall. While its hyena cousins have four toes, the aardwolf gets about on five toes per paw. Upon reaching maturity aardwolves can produce between 1 and 5 cubs, which are born during the rainy season, when termites thrive and are at their most active. Young aardwolves spend the first 6 to 8 weeks with their mum in the burrow and at 3 months old they emerge for supervised foraging trips. At 4 months old they start hunting independently from their mums. In captivity aardwolves can live up to 15 years. Unfortunately, in some areas of Africa the aardwolf is hunted for its fur, in others it is poisoned, although mostly it is not regarded as a threat to livestock and tolerated by farmers. Marauding wild dogs on the other hand are a threat to the aardwolf, while a fully grown, powerful hyena would regard a dog probably as a tasty snack. Looking at the strange creature snuggled up in its burrow, I wonder if the aardwolf isn’t suffering from some sort of identity crisis. A skeleton that’s more like a cat with its front legs being longer than the hind legs and a downward sloping spine, a name that reminds us of aardvarks, an insect diet to match and a fur that looks like a stripy hyena – what creature of the night looking like that wouldn’t wish for a lucky break, where it could swap with an 11-year-old vampire girl? However, there are precious few open grasslands and savannah-type territories in Stinkforthshire and African termites are also not so easy to come by, when you live in England. 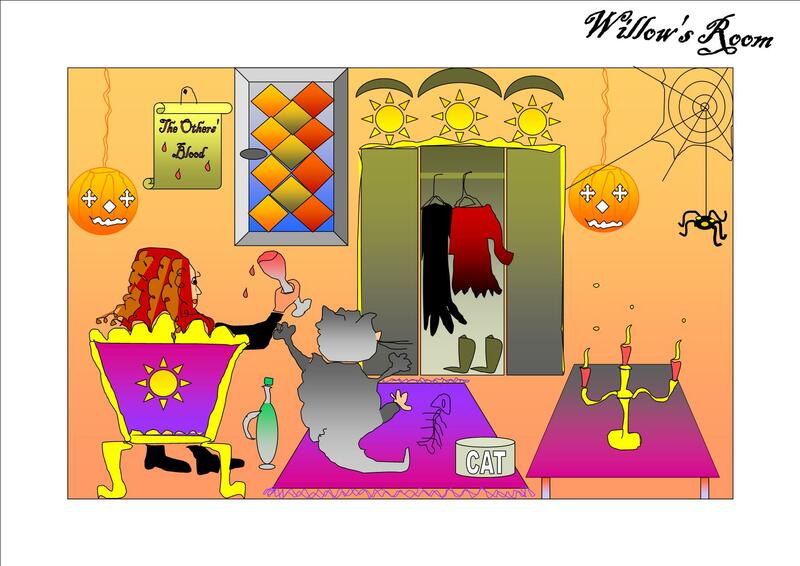 If Willow the Vampire is going to explore, whether the grass is really greener on the other side – namely if being a different creature for a while is more fun – I must find a nocturnal animal that matches her personality and aspirations or she ends up being like comic book hero Spiderman, all animal cudos but no real sense of who she is. No hang on, I already did that in the first novel – I made my main protagonist a GIRL…that’s enough evolutionary trouble to be getting on with! Oh my! Willow’s room looks like mine! I vote for the aardwolf – maybe Willow could rescue it from one of those people who think it’s clever to have creatures like crocodiles as pets? The real Willow sounds a delight. I haven’t finished the first book yet, but might not a family who enjoys eyeball pizza have a distant relative who is one of these people? It may even be some integral part of the mystery surrounding why parts of the family are not discussed. 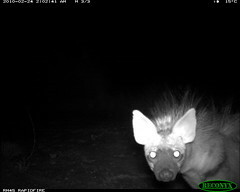 Yes, the aardwolf is amazing, such a strange creature. It would probably scare quite a few people, if they encountered it at night, since it’s so similar to a hyena, which could rip somebody’s head off without breaking into a sweat.